Summit Orthopedics introduces its newest state-of-the-art center for orthopedic care in Eagan, MN. Conveniently located off 494 and Pilot Knob, the Summit Orthopedics Eagan location offers the full continuum of orthopedic care and treatment under one roof. For those patients flying in from out of state, our destination orthopedic center is located just minutes from the Minneapolis/St. Paul Airport. For those times when you need walk-in care, our OrthoQUICK clinic is open daily. It is staffed by a highly trained orthopedic team ready to treat bone, joint and muscle injuries. It’s perfect for concerns like sports injuries, knee pain, strained muscle, and broken bones. No appointment is needed, just come on in and get care when it’s convenient for you or your busy family. If there is a holiday hours change or closure, we will place an announcement banner on the homepage. At this Eagan location our physicians diagnose and treat the spectrum of bone, joint, and muscle conditions and injuries. And you can get an X-Ray or an MRI right in clinic as well as therapy, bracing and orthotics, guided injection procedures, and surgery. Whatever is getting in the way of your healthy, active life, the orthopedic experts at Summit are ready to support your goals for recovery. 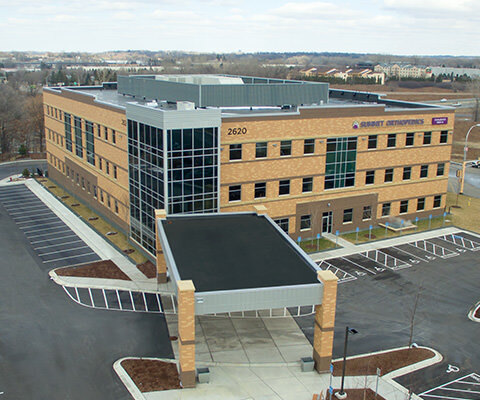 When arriving at Eagan, you will see a main entrance that includes a patient drop-off area. There are wheelchairs available (located within the entryway). The main clinic and OrthoQUICK check-in desk are on the first floor, just as you walk in. There is also an information desk on the first floor to assist with any questions, directions, and concerns. If you are here for physical therapy, hand therapy, MRI, spinal injections, or joint camp, you will check in on the second floor. You will not need to check in or stop on the first floor, and you can head directly to floor two. The procedure suite is also located on the second floor. If you are visiting someone who has had surgery at Eagan, and the patient is in the Care Suites, that person will be on the second floor. Surgery Center is located on the third floor. The elevator is located to the left as you walk in the main entrance. The physician and everyone else involved with my surgery were courteous – I could not ask for better personnel. Everyone went out of their way to make sure I had a good experience. I loved coming to your Eagan facility. It is beautiful and very functional. To sum up my experience with the Eagan Summit Ortho would be to say “your team hit a home run” with my care! Thank you! Loved everyone. Trusted and amazing people.